It’s Another Cash Cab Giveaway! Need an extra $50 in your pocket? Well today is your lucky day! [insert circus music and confetti] We’re having another Cash Cab giveaway here at B-Side Blog, and the lucky winner will receive a $50 Visa Cash Card. The rules are simple. Leave a comment, and then I’ll draw a name at random. It should be marvelously exciting. 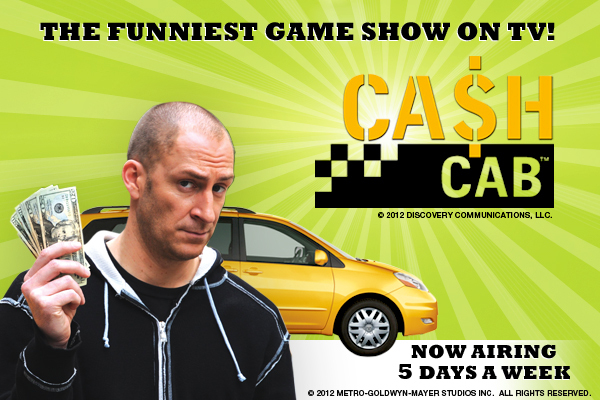 Discovery’s Emmy winning hit Cash Cab is now airing 5 days a week! This entry was posted in Television and tagged Cash Cab, contests by Ben Mandelker. Bookmark the permalink. We watch Cash Cab during lunch at my office every single day. We love it! I saw Ben Bailey do stand-up years ago. One of the funniest sets I’ve ever seen. He did stand up? You’d never know it from his lame one-liners! I saw his stand up too and it was pretty hilarious. I love Cash Cab! It’s the best game show on television! Love it! Thanks so much for the random chance to win! Well- since circus music is playing… circus afro, circus afro, polkadot polkadot polkadot afro! You should ban zb from this site for singing that song. I need $30 to pay for my BB Live Feeds. I always enjoy Cash Cab, but I think Cash Livery Driver on TruTV might be even better. i can’t believe i could possibly win 50 big ones all cause of Cash Cab, and i’m not even in the cab! Much like the successful CSI spin offs, I think there’s potential for other cities. Cash cab: Tulsa, coming soon. Ooh I like the way honeybunny thinks! ^ That was supposed to be a clever, parenthetical remark, but it was interpreted as HTML markup. My son and I play along at home! We keep score and the winner gets to pick the movie we go see. You know our very own OD-TV was on Cash Cab. Yes, he won money; it was very exciting. Welcome to the Cash Cab!!! Great show. Hailing the Cash Cab right now. This show and Price is Right are my dream game shows to be on. Best game show on TV right now. It’s a shame it’s ending soon. Here’s to hoping my random comment gets chosen. I’ve never seen the show but have heard good things! Commenting on the cash cab shindig! I like playing trivia games in taxis. Almost as much as I like an extra $50 in my pocket. I would pay good money to watch Cash Cab: Tulsa. I would demand my mom take cabs everywhere. She would be ratings gold. Did you read the one about “Cat Cab?” Instead of getting in and finding Ben Bailey behind the wheel, it’s a cat driving! My dh, son and I can get very competitive watching this show! Pick me!! I’ve always wondered: Do they just drop you off in in a possible crack neighborhood if you lose, or do they hail you another cab? Woot, two things I love: cash cab and money! wahoo I love Cash Cab! Cash Cab is fine and all, but it can’t compare to the reruns of Laguna Beach/The Hills that MTV is marketing as “Retro MTV.” What I wouldn’t do for you to re-recap each and every one of those gems. Roz forever. Love that show! Long time reader of your blog. So looking forward to your BB recaps! Any plans to see a live show? I like this show. Thank you for the giveaway! I could sure use $50! Thanks for the chance! Just saw this show for the first time – pretty cool. Holy moly! I would love to win! Ben M and Ben B. Oh how I enjoy both of them.